The setting is February 2008. The Memphis Grizzlies have reached their peak with Pau Gasol. At their best, they are a middle of the pack team in a dominant Western Conference. At their norm, they are a surefire lottery mainstay. Producer A: I have an outrageous idea for a new movie. Have you read that book Moneyball by Michael Lewis? Producer B: About the Oakland A’s? Yeah, I’ve read it. Pretty interesting. Producer A: Well, I was thinking, what if we made a movie about that stuff, but we make it about basketball? Producer A: Well, how about this? We make a movie about two really crummy teams in the NBA. I’m thinking small market bottom feeders without much going for them. Producer A: Well, we take those bottom feeders and we make them do some really outrageous things. Like, jeez, I don’t know, say, give a max contract to an unproven center. Or, maybe, we can have one of the teams trade its best player at the deadline for a few role players and consequently get better out of the trade. Producer A: I got it! We’ll have the two teams be the Grizzlies and the Pacers! Memphis? Indiana? Can there be a more random two teams in the league? I mean, yeah, Pau’s a good player and Jermaine O’Neal looks like he can still be a solid once he gets healthy. But man, those teams stink! Producer B: So what’s your plan? We have Pau and O’Neal lure other stars to play alongside them? Producer A: No. I’ve got something much better. You know how Pau has a younger brother named Marc playing in Europe right now? Well, take my word for it, he does. And Marc’s overweight! It’s hilarious. He huffs and puffs up and down the court. And here’s the best part: you know how Pau is like the smartest big man in the league? Well, his brother tries to play like Dirk! He shoots from the perimeter even though he has to be around 300 pounds. His touch isn’t great either! Also, he also can’t rebound the ball very well. Producer B: So you’re saying we get Marc to play alongside Pau in Memphis? Producer A: No, I’m thinking crazier. How about we get Pau traded from Memphis for Marc! Can you imagine that? A brother swap! Coincidentally, Marc’s draft rights are owned by the Lakers. How about we give Kobe a guaranteed ring or two by essentially handing the Lakers Pau on a golden platter. Producer B: Stop it! No way. I understand that Chris Wallace makes some questionable decisions but do you really expect anyone to believe that he’d just give the Lakers Pau freakin’ Gasol for his overweight brother? Producer A: You’re right, let’s make it look less suspicious. How about the Lakers give the Grizzlies Kwame Brown’s expiring contract and a few picks. That way Wallace can sell the trade as a move for the future to his fans. Producer B: I guess that’s palatable. I mean, it’s still a really lousy trade. Let’s have it go through under the provision that we can get Stephen A. Smith to do cameo in the film and give us a Kwame Brown rant on live TV. That way, when the movie tanks, we can try to spin it off as a comedy. Producer B: So the Grizzlies get a bunch of garbage and the Lakers win a championship. What good does that do for your Moneyball idea? Producer A: Well, how about this? 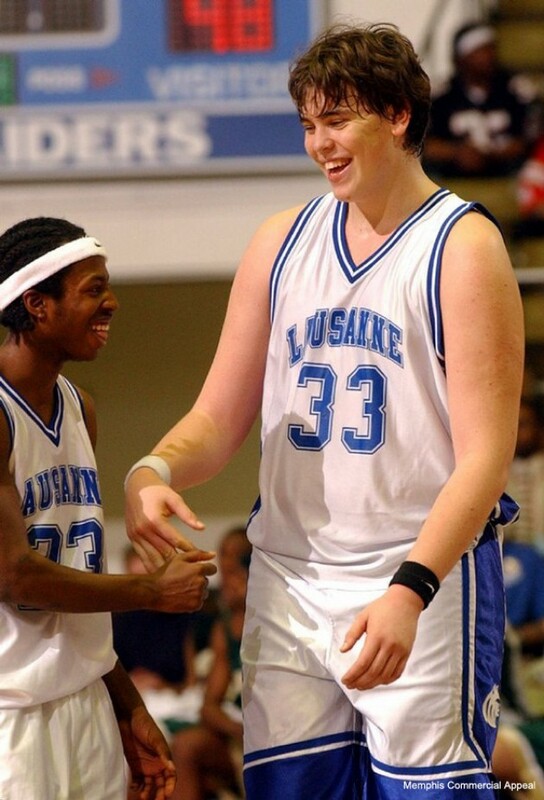 What if Marc Gasol comes to America and actually becomes good. Like, really good. Like better-than-Pau good. He loses tons of weight and proves that he can run the floor. Let’s have him develop a funny but reliable set shot from eighteen feet away. Let’s have him turn into a point center! He can average like five assists per game! Producer A: Let’s turn him into Dirk! It’ll be like Like Mike. He’ll have wished he was Dirk for so long and one day, he’ll lace up his sneakers and voila, he’ll have a lethal three point shot. Did I mention that he’s like 7’1”? Producer B: No, we can’t have that. No one would believe it. Producer A: Fine. I’ll settle on him just becoming one of the best defenders in the NBA. We won’t be able to prove it to old school executives who solely rely on blocks and steals as indicators of good defense but we’ll have our Moneyball statisticians help show his value. I mean, he is 7’1”, the least we can do is make him an enforcer down low. Producer B: Fine. I guess that makes sense. Producer A: But here’s something to consider. What if we did the exact same thing in Indiana???? Producer B: Jesus, you just keep pushing it, don’t you? So now you’re going to say Jermaine O’Neal has a little brother? Producer A: No. What are you, crazy? Jermaine O’Neal’s been in the NBA for like forty five years. And he’s only like 29. Producer B: So what then? Producer A: Well, let’s do this. Let’s have Larry Bird trade O’Neal to the Raptors. We’ll have him explain to the media that O’Neal was too injury prone and that this was way to get a young point guard like T.J. Ford before O’Neal’s stock plummeted. Producer B: Wait, I think I’m missing something. What do T.J. Ford and Pau Gasol’s little brother have in common? Producer A: Wait for it… how about we get the Raptors to also give the Pacers a first rounder or two in the trade. One of them can be a seven footer. Producer A: Eh. I was thinking more obscure. 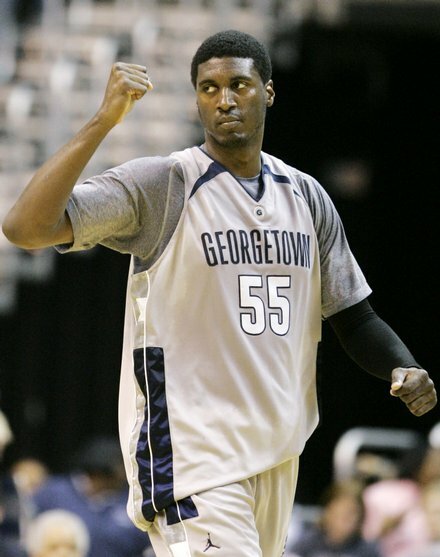 How about that giant goof from Georgetown? Producer B: You mean Hibbert? Roy Hibbert??? The guy who legitimately couldn’t run on a treadmill when he first got to school? The seven footer who averaged 5.9 rebounds for his college career? You want to make him an elite NBA defender? Producer A: Yeah, why not? Producer A: Ok. So this Hibbert guy is thrown into the Jermaine O’Neal trade. The Pacers will look bad for a while but at least they’ll have Danny Granger shooting the lights out to keep them from becoming the worst team in the NBA. Producer B: Well, how about we give Gasol and Hibbert some years to develop and think of other ways to make the teams better aside from just those two. Producer A: That sounds good. We’ll have Rudy Gay develop into a super scorer in Memphis and we’ll have Granger maintain a level of all star play in Indiana. Producer A: We need more sidekicks for these guys though. How about this? Let’s have the Grizzlies get a troublemaker like Zach Randolph for a cheap price. Producer B: Aren’t we trying to help the team become a dark horse contender? I feel like every team Randolph goes to gets invariably worse. Producer A: Well, let’s have something in Memphis turn Randolph into a good guy. Hell, he can credit it to the BBQ ribs, the maturity, or the small-town feel. Whatever the case may be, we’ll just turn Randolph into a genuinely good teammate. Producer B: Well, that’s nice but it doesn’t really make sense. Besides, I don’t know if the Knicks can just trade him. I mean, they just got him from Portland! Producer A: (Thinking) Let’s have the Knicks overhaul their team in pursuit of clearing cap space for LeBron James in 2010. They’ll dump Randolph to the Clippers for some expiring contracts. Then we can give the Clippers a star like Blake Griffin in the draft. It’s a win-win. The Clippers will get a good young player and can then make Randolph expendable. Producer A: Here comes the best part. Bare with me here, the trades will all come full circle because the Knicks will replace Randolph’s size on the roster by trading Quentin Richardson to Memphis for Darko Milicic. Then, a few months later, we can have Memphis trade Richardson to the Clippers for Randolph straight up. Everybody wins. Except for Darko and the Knicks of course. Producer B: I actually like that idea. Producer A: Also, let’s have Mike Conley pan out. I know he’s looked really shaky in his rookie season and I know that there are about twenty other available free agents who will be better than him in the short term. But I still like him. We’ll give him some growing pains along the way but he can be Memphis’ point guard of the future. Producer B: Fine, Conley it is. How about these Pacers though, what should we do with them? Producer A: Let’s have them unload all of their long term contracts in deliberate fashion and then surprise everyone by stealing David West in free agency. Like really steal him. We’ll have a great team like the Celtics find a loophole in the CBA to acquire a star like him. But then we’ll have the Pacers intrigue West with the appeals of playing a bigger role for a younger team. West will bite. He’ll also be coming off of an injury so his asking price will be lower than what it should be. Producer B: How about we give West a decent 2 year, $20 million deal but then have the Kings commit over $50 million guaranteed to some reserves like Chuck Hayes and Marcus Thornton in the same month! Producer A: Yeah, I can totally see that happening. With the Maloofs, anything is possible. Also, the Pacers should fire Jim O’Brien midway through an upcoming season and replace him with an interim no name like Frank Vogel. And guess what? Vogel will turn out to be a great coach and Indiana will sign him to a long deal. Producer A: You’re right. Let’s have them luck out in the draft. We’ll have them pick some college stars like Brandon Rush from Kansas and Tyler Hansbrough from UNC who will go on to disappoint in the NBA. As a result, Indiana will realize that they need to take some risks in the draft by scouting unknown prospects with lots of athleticism. What’s the most random mid-major school you can think of? Producer B: (Thinking…) Fresno State University? Producer A: Yeah, that’s pretty damn random. Now, let’s look at their roster. (Browsing…) It looks like they’re going to have this guard named Paul George next year. I like the name. It’s two first names in one. Perfect! He can be the next Michael Jordan! Producer B: So what? You want this George guy to just become an NBA player out of nowhere? Producer A: No. I want him to turn into an NBA all star out of nowhere. We’ll start small. He can grow like six inches from high school to college. Then, the Pacers will recognize his upside and take him somewhere in the lottery. Let’s say tenth. Then, we’ll put him into both the three-point shootout and dunk contest in his sophomore year. Next, we’ll give him two more inches to grow. He can be a legitimate 6’10” athletic swingman. Naturally, he’ll become an elite defender and an awesome scorer by year three. Producer B: So, Hibbert, West, Granger, and this George guy? Producer A: Well, hold on, let’s wait it out a little bit. Let’s go back to Memphis. We’ll say that the Grizzlies make some other shrewd moves. We’ll screw over Boston again. Just a year after we give the Lakers Pau and make LA a legitimate threat to the Celtics’ dynasty plans, we’ll have Memphis swoop in and sign Tony Allen away from Boston. Producer B: I like Tony Allen but do you really think Boston will care that much? Producer A: They will when he becomes the best perimeter defender in the NBA! Allen on the outside with Conley? I’m telling you, they can make for an All-Defensive backcourt together. Producer A: Kevin Love! He’s their guy. We’ll give the Grizzlies Kevin Love out of UCLA and have them secure the best frontcourt in the NBA alongside Gasol and Randolph. Producer B: I don’t know, I think the team needs another scorer on the perimeter. Producer A: How about this: let’s have the Grizzlies draft Kevin Love and then trade him for O.J. Mayo. It needs to happen! This world needs a Gay-Love Era in Memphis, even if it is for just one night. Producer B: Fine. I guess Mayo has star potential. Let’s also have Memphis strike out on the other lottery pick to cover up suspicions that everything is going right in Memphis. Let’s have them pass on guys like James Harden and Stephen Curry in the draft and have them take a guy like Hasheem Thabeet. Producer A: I like it! Even though they’ll have Gasol, we can say that they thought Thabeet was going to be really good. So let’s recap: Mayo will be the team’s sixth man and Thabeet will be the team’s designated towel boy. Next, Memphis can give up on Thabeet really quickly and trade him for a proven veteran. Then we can have them make a playoff run. They can be the eighth seed and, out of nowhere, dismantle an aging Spurs team. Producer B: An eight seed beating a one? You think Popovich would let the Spurs flop like that? Producer A: Let’s make it happen. Gasol will have a coming out party. Randolph will be dominant. Conley will look great. Mayo will provide a scoring punch. Also, let’s have some reserves break out of their shells. Greivis Vasquez, that scorer from Maryland, he can be a second round pick and become an unselfish sparkplug off the bench. Producer B: What about Rudy Gay? You didn’t even talk about him. You can’t possibly think that Memphis will beat the Spurs without Rudy Gay. Producer A: Oh, that’s right. I forgot to mention. Gay will miss the entire postseason after shoulder surgery. But remember how they traded Thabeet for a veteran? That veteran will step up. Producer B: Like who? Caron Butler? Shawn Marion? Jason Richardson? Producer A: I was thinking Shane Battier. He seems like he’d be a guy that some saber metric statisticians would love. Producer B: Ok. Battier’s a good call. At the very least, he can shoot threes and defend Manu well. Producer A: So then they’ll eventually lose to the Seattle Supersonics and Kevin Durant in the second round. Wait. Let’s have the Sonics move to Oklahoma City! We’ll name them the Durantulas! Producer A: Ok. We’re getting off topic. Regardless of where Durant is, he will beat Memphis. But still, the Grizzlies will gain some postseason confidence and will be able use it in the future. Producer B: So what about Indiana? When do they come together? Producer A: Well, let’s have Hibbert become really good by 2011 and then also give them a Jimmy Chitwood hometown hero in 2012. Producer B: Eric Gordon’s from Indiana. How about him? Producer A: I was thinking of someone more unknown than Gordon. Have you heard of a kid named George Hill from IUPUI. It’s a really small school in the state. I think he’d fit the bill. Producer B: I’ve never heard of him. You really think a kid from IUPUI can become a good NBA player? Producer A: Well. Let’s not have Indiana draft him. That’s too suspicious. Let’s have Hill go to San Antonio and play well. Then, we’ll have the Pacers draft a kid from California with a cool name and like Kawhi Leonard. San Antonio won’t be able to resist the name. They’ll offer Hill for Leonard and both teams will be very happy because they will both get exactly what they need. Producer B: A win-win trade? Does that ever happen in the NBA? Producer A: You’re right. I love the sound of that. Let’s do the same thing in Memphis. They’ll trade the flashy Vasquez to the Hornets and he’ll go on to play well as their starting point guard. New Orleans will realize that they love obscure names like Greivis so much that decide to change their name to the Pelicans! Producer B: The New Orleans Pelicans??? I can see it! Producer A: But then we’ll have the Grizzlies get a guy with a cool name back in the trade: Quincy Pondexter from University of Washington. The Grizzlies fans will love him. They’ll call him Q-Pon! He’ll quickly become a super-sub off the bench. He’ll defend well and hit corner threes with the best of them. Producer A: We’ll also have the Grizzles agree to sign Marc to max contract despite him looking like a borderline all star at best. Then, a year later, without money to spend, the Grizzlies will be forced to give up on O.J. Mayo and let him walk as a free agent. Soon after, we’ll have them realize that they can get a guy of equal production to Mayo, like Jerryd Bayless, for a lot less money. Producer B: O.J. Mayo and Jerryd Bayless are equal producers? Are you sure? Producer A: I’m positive. Bayless just takes a lot less shots so it looks like he can’t score as much. However, when he gets the touches, he can really light it up. Meanwhile, in Indiana, let’s have the Pacers luck out and get one last great player in the second round. Producer B: A great player in the second round? That seems pretty unlikely. Producer A: Well how about this. You know Lance Stephenson? Producer B: That New York City prodigy? Producer A: Yeah! Let’s have him scare teams off in the draft because of his attitude. Then, we’ll have him fall to Indiana at like 40th overall and, at that point, the risk over taking him is negligible. Producer B: What if we have him start off slowly but then form an unlikely bond with Larry Bird? Bird can become his mentor of sorts. Producer A: I love that! Stephenson will be really immature and ride the bench. Then, when the Pacers hit their stride in 2012 and actually take a 2-1 lead on LeBron James and the Miami Heat in the second round of the playoffs, we can have Lance taunt LeBron from the Pacers’ bench. Then, when LeBron goes on to dominate the Pacers, fans will blame it all on Stephenson! Producer B: LeBron and the Miami Heat? You mean LeBron and the Cavs? Producer B: I love your creativity but I really think we have to think we have to keep things believable. Producer A: We can discuss the Heat thing later. In any case, after the Stephenson taunt, LeBron and Wade will go into beast mode and dispatch Indiana in six. Producer B: So the Pacers get bounced? Producer A: Yeah, but they will have realized that they can actually compete with any team in the league. They’ll be forced to give Hibbert a max contract as a restricted free agent because Portland will overbid to scare the Pacers from matching the offer. Producer B: That sounds plausible. But won’t they have Greg Oden already? Producer A: No. Don’t ask about Oden. He’ll have been forced into retirement at this point. But anyway, back to Indiana. They’ll get adventurous in the summer of 2012 and trade some role players like Darren Collison and Dahntay Jones to Dallas for a reserve big man like Ian Mahinmi. Everyone will blast them for overspending to get Mahinmi but he will prove to be a very effective backup center. Producer B: Ian Mahinmi? I’ve never heard of him. I guess I’ll have to take your word for it. Producer A: Now, don’t hate me but I think we can be even more daring with the Memphis storyline. How about this? We have them bring in a statistician like John Hollinger from ESPN to be their VP of basketball operations in 2012-2013. Then, the team will immediately go into a minor overhaul midway through the season. Producer B: But I thought you said they were a good team now? Why would they overhaul their roster? Producer A: Yeah, they will be a good team. But, for entertainment’s sake, we should have a new ownership group with random celebrities like Justin Timberlake and Peyton Manning come in and buy the team. Hell, we can probably have those guys make cameo appearances in the film! Producer B: So why will they overhaul the team? Producer A: Naturally, these new owners will be afraid to go over the luxury tax threshold. Therefore, they will unload several contracts to avoid having to pay millions. Let’s have them trade three role players and a pick to Cleveland for a single D-League talent just to clear $6 million from the cap. Producer A: Then, like a week later, we’ll have them trade Rudy Gay! Producer B: What??? This is where I have to put my foot down. Why would they trade Rudy Gay when they already got below the luxury tax? He would be one of their franchise’s all-time leading scorers at that point! Producer A: Well, remember how they will have succeeded in 2011 without Gay? Memphis’ statisticians will tell their executives that the numbers validate that the team is actually better when Gay is off the court. We can get a team with no real idea of how to manage a budget to trade for Gay. Producer B: Toronto sounds like the perfect team for that role! Producer A: Agreed. So in the Gay trade, we’ll have them bring in a similar player to Battier. Maybe Tayshaun Prince. The Pistons will be looking to get younger and Prince deserves to play in the playoffs again. Producer B: So Gay will be gone but they’ll have Battier, Q-Pon, and Tayshaun? Producer A: Oh wait. You’re right. That’s too many small forwards. Let’s back up and have Battier leave as a free agent and chase a title with LeBron, Wade, and Bosh in Miami by signing for way less than what he’s worth. He can be the Heat’s sixth man. Producer B: Are you sure we’re not making Miami unrealistically good? Producer A: No, I’m not sure at all. They’ll probably go on some sort of outrageous winning streak or something. But anyway, back to Memphis following the Rudy Gay trade. Let’s have them struggle mightily right after the trade happens. Their coach, we’ll give that position to Lionel Hollins, will passive-aggressively complain to the media about his front office’s decisions. Then we’ll have rumors flying around that the Grizzlies are also looking to deal Zach Randolph. Tony Allen will vent his frustrations to the media and Mike Conley will doubt that the team will ever recover from the trade. Producer B: So another fire sale? Producer A: Well, here’s the thing. I want Memphis to miraculously find its groove and end up holding onto Randolph. Then, just as the statisticians theorized, Conley, Gasol, and Randolph will all benefit from sharing the touches that would have been going to Gay. Tayshaun will slide into the starting lineup and they will remain as one of the league’s best defensive teams. Producer B: Wouldn’t they struggle for points though? Producer A: Well, maybe in some games. But, for the most part, it won’t matter. Their big men will dominate the boards so effectively and their perimeter defenders will generate a lot of easy baskets in transition. Producer B: That makes sense. Producer A: Now, again, don’t get mad at me but I have another crazy idea. What if the Pacers also lose their biggest star and end up getting better as a result? Producer B: You want them to trade Danny Granger? Producer A: No. I actually think the Pacers will be good enough to survive without receiving any compensation for Granger. Let’s have Granger injure himself early in the season. Then, in his absence, Paul George can develop into a superstar. Everyone will step up. Stephenson will mature and develop into the best rebounding shooting guard in the league. West and Hibbert will become dominant inside. George Hill will have a breakout season. Their starters will be among the league’s best. They will have one of the most efficient defenses in the league and Hibbert will start to look like Dikembe Mutombo. Producer B: How exactly do you expect these statisticians to measure efficient defense? Producer A: Well, how about this. We take a large number, say, 100. And we measure how many points are scored against a specific player or team over 100 defensive possessions. My guess is that the most efficient players and teams would allow fewer than 100 points in 100 possessions. Producer B: So let me get this straight. You want the Grizzlies to trade Rudy Gay and you want the Pacers lose Danny Granger to injury. Then, as a result, you want both teams to become legitimate title contenders? Producer B: I think you’re insane. Producer A: I might be. I just really think this would be an incredible story to tell. Producer B: So where does the story end? Producer A: Well, that’s what I can’t really figure out. I know both teams will be really good. And I know I want the Grizzlies to catch a few breaks in the playoffs to eventually go on and get revenge against Kevin Durant en route to the Western Conference finals. Meanwhile, I also know that Indiana will be good enough to get to the Eastern Conference finals without needing much luck on their side. Producer B: Well, do you know what team you want the Grizzlies to face in the West? I figure you must already have Miami’s super-team coming out of the East. Producer A: You’re right. I do think the Pacers will have to face the Heat. For the West, I was thinking San Antonio. I know they look old now and will look even older five years from now. But think about: if the Spurs continue to get cheap young guys to serve as role players, it’s not that crazy to think Gregg Popovich will figure out a way to preserve his best players’ longevities for a long time. Is it? We can have San Antonio take the series’ first three games. Also, two of those games should go into overtime! Still, I’m not sure if I want the Grizzlies to lay down after falling into a 3-0 hole or if I want them to come back and make it a series. Producer B: And what about the Pacers? Producer A: Yeah. I haven’t decided on them either. I think we should have them fall in overtime to the Heat in Game 1. Then we can have them come back strong to tie up the series in Game 2. We’ll improvise from there. One way or another, the Pacers and Heat will be competitive throughout. Originally published on Sheridan Hoops on May 26th, 2013.